For 12 high-school Maritime teams, O.R.E.O. doesn’t mean the cookie; it was their chance to test out their entrepreneurial skills. The teams descended on the University of New Brunswick Saint John campus on April 24th to compete in the annual Orientation to Running an Entrepreneurial Organization (O.R.E.O. ), a long-standing competition. 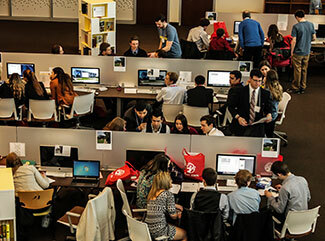 Working with faculty, staff and students from the faculty of business – as well as a number of business leaders from the community – students will be given the opportunity to run their own café and make all business decisions from products to hiring staff with the help of a computer simulation called BizCafe. “O.R.E.O. is a great way to introduce students to some of the actual issues involved in running a business such as marketing, setting prices, purchasing equipment, borrowing money, and staff training,” Brenda Collings, O.R.E.O. coordinator for UNB Saint John’s Faculty of Business. Students in the competition not only got a taste of what business is actually about, they also had a chance to visit the campus and see that what it has to offer, as well as speaking with students close to their own age about university life. “It’s also a great chance for our current students, who act as consultants, to apply what they are learning in the classroom,” explains Dr. Shelley Rinehart, O.R.E.O. founder and business professor. The program has evolved since its inception 18 years ago. What began as a recruitment initiative has become a well-established, and recognized, business introduction event. MONTY MUGS, the team from Montague High School, Montague, PEI won $2,500 cash for placing first. The second and third-place teams (Grinded from Kennebecasis Valley High School and Cal Café from Fundy High School) received $1,000 and $500. All students in the top eight finalist teams were also given a $200 tuition credit from UNB Saint John. Many local businesses also generously donated door and team prizes. “Everybody involved – the faculty, volunteers, community partners and teams – learn something,” says Rinehart.